Global System Mechanic is a PC optimizer supposedly providing you with all that it needs to function properly. This desktop application cleans the Windows registry and fixes system startup-related issues; however, security experts do not consider these characteristics highly outstanding and attribute the Global System Mechanic software to the category of potentially unwanted programs (PUPs). This category includes programs that arrive at the computer as legitimate applications offering the user some enhancement, but it turns out that the programs cause the user some inconvenience. PUPs are usually those programs that are distributed alongside other programs, and the system booster Global System Mechanic is one of them. Global System Mechanic has its official website wisesystemtools.com; however, bypassing this websites is not sufficient because the software is distributed by bundled setup files. For example, it is known what Global System Mechanic is spread alongside AVAST Antivirus and Driver updater. This is likely to be a temporary cooperation, because software developers change bundle files from time to time to increase the likelihood of the installation of their program. System optimizers are used for a few purposes. For example, they scan the Windows Registry and identify outdated or no longer necessary registry keys, which usually become useless when the file to which a registry key used to point is deleted from the system. Cleaning out registry errors might have some effect on the overall performance of the PC, and here is it important to stress that cleaning the registry is not a guarantee for better performance, because much depends on the very registry. 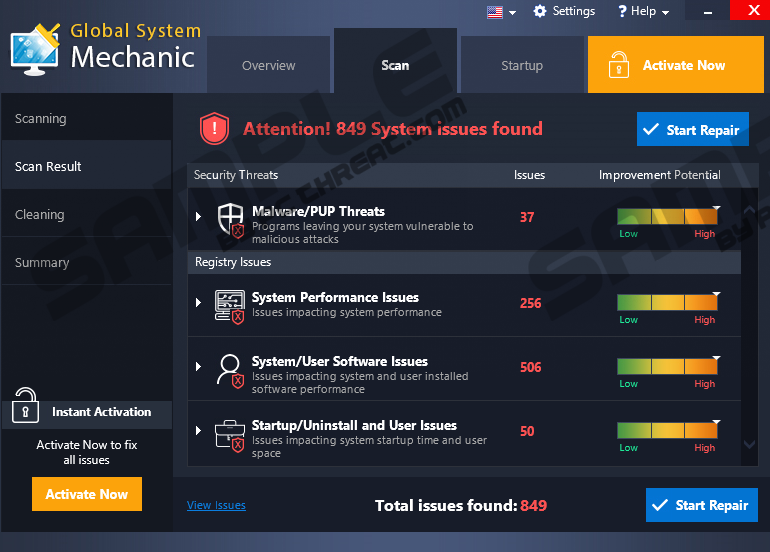 Global System Mechanic is presented as a tool that can keep your PC error-free and enable smooth running, but we cannot assure you that you will notice any different after having unnecessary entries removed. Additionally, Global System Mechanic is said to manage system startups to make the PC boot faster. Startup or PC booting problems usually occur over time when more and more programs are installed and all of them attempt to be part of a startup routine. That, in return, makes the PC slower and you frustrated. Global System Mechanic is said to be capable of fixing such issues, but you should bear in mind that you can disable startups manually using the Task Manager (in Windows 8 and 10) or the System Configuration utility, which you can access by pressing Win+R and typing in the command msconfig. Global System Mechanic also has the quality of cleaning adware from the system and web browsers. Moreover, it offers lifetime support. All these features become available only after purchasing the license of the application, which costs €23.95. Affected users are encoured to invest in this application by pop-up notifications containing information about the issues detected. We advise you against making a snap decision because there is no need to hurry. You can try fixing the issues yourself, especially if you have not noticed any sluggishness of the PC. Some experts are very skeptical about system optimization tools because they consider such programs ineffective. The fact that Global System Mechanic is spread as part of a bundle suggest that its developers are desperate to increase the number of the end users and, without a doubt, to earn money. If you want to try a system optimization tool, we recommend finding a free one that is safe to use and have already gained a reputation. If you have no intention of using Global System Mechanic, or do not know how it was installed, take action to remove it from the computer. You have two options: manual and automatic removal. Below you will find a removal guide that will help you uninstall the system optimizer, but you should also consider installing anti-malware. Global System Mechanic is nothing compared to what might happen to your OS and personal data when the PC gets infected with malware or ransomware. There are hundreds of thousands of ill-purposed threats that should never find their way to your device, so do not let that happen. Shield the system right now so that you can connect to the Internet and enjoy browsing the web safely. Right-click (Win 8/Win 10) or click (Win 7) the Start button. Under Programs, select Uninstall a program and remove Global System Mechanic. Quick & tested solution for Global System Mechanic removal.